Sharing and recollecting memories with seniors in long term care helps them to affirm who they are and to maintain self worth. It is also a stimulating mental activity, promoting good social interaction and strengthening friendships. Residents may benefit from listening to the wonderful and touching stories of their peers. Reminiscing stories may be video recorded with the resident’s permission and as per facility protocols. If this is not possible, chronicle the memories in a scrapbook to share with members of the families. You may invite families of residents to join the reminiscing session and prepare a themed subject with half a dozen questions. Choose questions that stimulate the five senses; smells, taste, sounds etc. 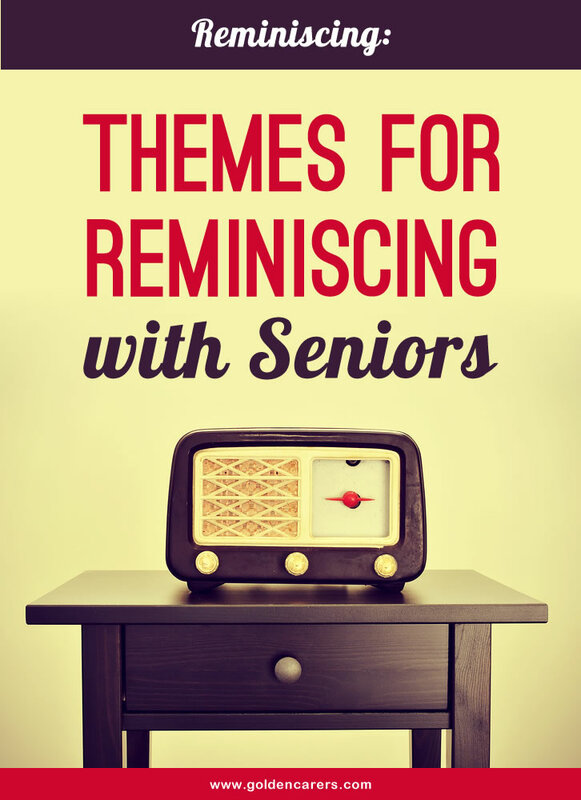 Reminiscing taps into memories from the past that most residents are able to recollect. Reminiscing sessions give staff a better understanding of their clients' needs, leading to improved care. Technology: How technology changed our world in the past 60 years. Teachers: The influence teachers have had on your life. Most people have strong memories of one or more teachers. The 1960s: What were they doing? Which songs were they singing? Which TV shows did they watch? Nutrition: What was the food like in the past? Did people go on diets? High-School Days: Were there bullies? How about drugs, gangs, nerds, peer pressure, rock & roll, cars? Winter comforts: What are the best comforts of winter? Food, clothes, activities? Old Time Radio: Which radio ads do they remember best? Palmolive, Coty. How about radio plays? Avengers, Benny Goodman, Buck Rogers, Dad and Dave? Bedtime stories: What were their favourite stories? Were there any stories they were afraid of? Who told you stories when you were children? Children’s pastimes: What sort of games did they play? Great TV shows? Comic strips magazines? Movie matinees? Medication: The most popular cough syrup, how often did people go to hospital, were babies born at home? Did home-made remedies work or were they just 'old wives tales'? Vintage Hollywood Movies: Romantic movies, best thrillers, favourite stars. Saturday Matinee Serials: Remember Zorro? The Adventures of Captain Marvel? Flash Gordon? Sherlock Holmes? How about the episodes which ended in scary cliffhangers? Does anyone have any advice regards group size? I'm going to be doing weekly sessions soon and I'm thinking of limiting it to about 8 attendees, i feel like a bigger group might inhibit some people and make it difficult for everyone to speak (if they wish). Any thoughts on this would be gratefully recieved, thanks in advance. I like using visual aids with my reminiscing...for example I took a toolbox in with old tools that had the men reminiscing and to offside that for the ladies I had an old beauty case and filled it with curlers, perfume, jewellery etc. I also got from my mother who was a teacher her training sewing sampler and that brought out many responses from residents, staff and visitors. Currently I am working on another toolbox which I am filling with mens items eg. bowtie, cravat, cufflinks, watch, pipe etc. The visual aids help those that can't hear join in with the activity and creates many fun times and storytelling. I use Reminiscing a lot even in and during other Group or 1;1 Sessions - great conversation starter. I find all stories told by our elderly to be fascinating ,educational and inspiring. Love reminiscing activities. But, one thing you need to be flexible. I tried the topic about Bedtime stories and mine reminded me that they didn't have power after dark and many of them didn't have electricity until the war. Not to worry, it is still a good idea as they talked about the dust storms and sleeping out on the grass amongst the mozzies. A lot of my ressies lived in little country towns or on properties in the outback.